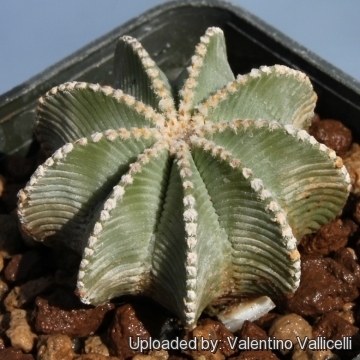 Aztekium hintonii Glass & W.A.Fitz Maur. Origin and Habitat: Aztekium hintonii is a narrowly endemic species restricted to a very small area in Galeana, Nuevo Leon, Mexico (area of occupancy are about 50 km²). The area is essentially a single location. The estimates in population size vary considerably, with 100,000 being an agreed lower limit and well over one million the upper limit (some people have estimated over 42 million individuals). Altitude range: It occurs at an elevation of around 1,200 metres above sea level. 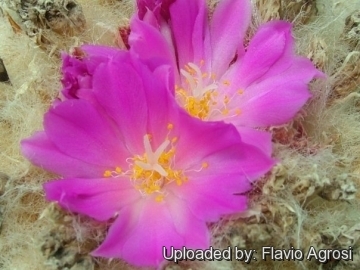 Habitat and ecology: This cactus is a soil specialist, i.e., a gypsophile. It grows in semi-desert shrubland, in a landscape of sharply incised gypsum and limestone canyons where it clings in great numbers to almost vertical walls, but A. hintonii grows more fully exposed to the sun than Aztekium ritteri, which tends to embed itself deeply into its canyon walls. A. hintonii and Geohintonia mexicana grows and coexist at some locations in the same general habitat of small, steep canyons and gypsum outcrops. It is threatened by ongoing illegal collection. However, the population is extremely large and the collecting does not seem to be causing any declines. Hence, the species is listed as Near Threatened. 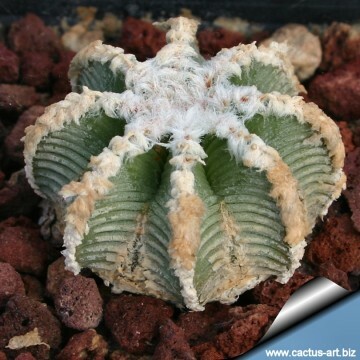 Description: It is a solitary globular to shortly columnar cactus (rarely clustering forming clumps of a few heads ). Stem: Greyish-green globular and squat, (rarely short columnar) reaching 20 cm by 10 cm in size, apex slightly woolly. Ribs: 10-15 acute, 6-12 mm deep, very pronounced, axil sharp. The deeply indented grooves between its ribs lack the secondary ribs of A. ritteri, and though it shares the transverse grooves, they are smaller and more symmetrically arranged. Areoles: Small and very numerous along the edge of each ribs, woolly in youth, up to 4 mm apart. Spines: 3, curved up to 13 mm long, greyish-white short lived not distinguishable as centrals and radials. Spines often are absent in mature areoles, even in young areoles they are highly reduced and very brittle. Flowers: Diurnal, magenta 1-3 cm in diameter borne at the stem tip, flower tube basally woolly. Blooming season: July – August when summer temperatures are at their maximum.Fruit:t: Round to elongated. Hidden within the woolly top, naked, smooth, thin walled, drying at maturity, that loses the perianth residual.Seeds: : Shiny brownish black, tuberculate ± 1m long and 0,5 mm in diameter. Hilum obscured by a strophiole. 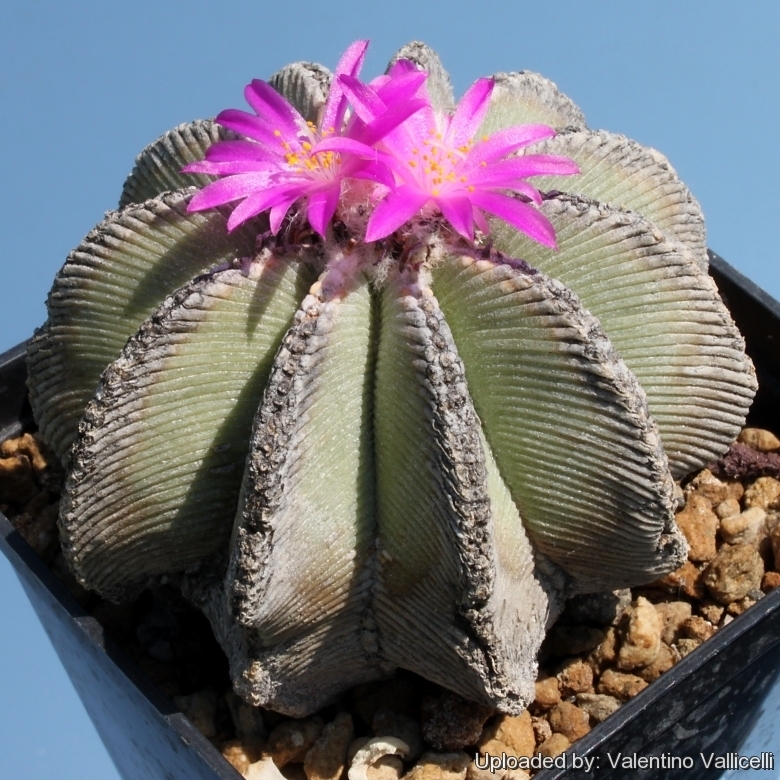 Notes: About taxonomy: The genus Aztekium contains three species of small globular cactus. 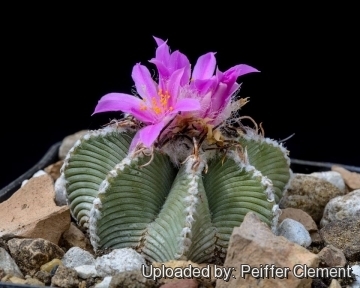 Discovered in 1929 by F. Ritter, in Rayones, Nuevo León, Mexico, this genus was thought to be monotypic (with Aztekium ritteri) until a second species (Aztekium hintonii) was discovered by George S. Hinton, in Galeana, Nuevo León in 1991. 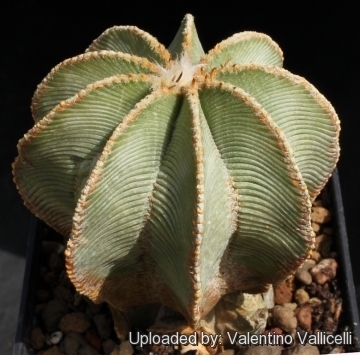 A further species, Aztekium valdesii, was discovered in 2011 by M.A. Alvarado Vázquez in the Sierra Madre Oriental mountains of Nuevo León... ...Aztekium Clade (consisting of Aztekium and Geohintonia) represents a relictual, yet highly specialized lineage forming a sister group to the remaining taxa of the tribe Cacteae. 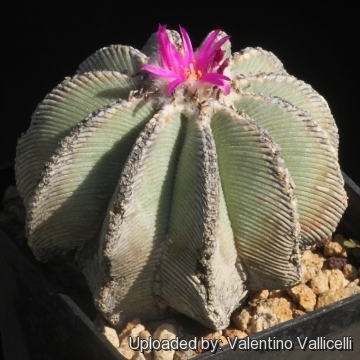 It is suggested that Geohintonia may represent an intergeneric hybrid involving Aztekium (probably Aztekium hintonii which is sympatric with Geohintonia ) and possibly Echinocactus horizonthalonius. 5) Fitz Maurice, B, Fitz Maurice, W.A., Hernández, H.M., Sotomayor, M. & Smith, M. 2013. 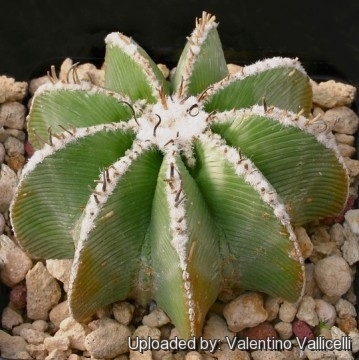 "Aztekium hintonii". The IUCN Red List of Threatened Species. Version 2014.3. <www.iucnredlist.org>. Downloaded on 13 December 2014. 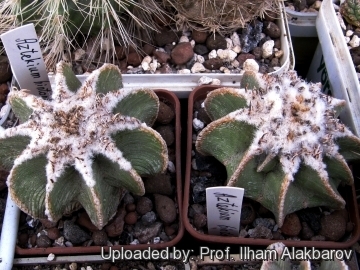 Cultivation and Propagation: It is of slow growth, but not as slow as A. ritterii. It usually takes several years for growth to be noticeable. Needs good drainage and regular water in summer. It should be dried out completely for its winter rest when it will withstand temperatures down to to -4°C for short periods. It prefers some shade. Once a specimen is established on its own roots it is no trouble to keep, and it becomes an easy plant to manage. The plants are often grafted to enhance growth speed. They grow best in full sun or half shade, which will help to maintain the lustre of the spines and plants compact. They are prone to mealy bug and red spider mite. Propagation: Almost exclusively by seeds. But the seedlings are very slow growing and at first they take one or two years to reach the diameter of 2 mm!!! Once they have reached 4 years old or more they are relatively easy to grow, the problem is getting them to 4 years old! Than they reach 2 cm of diameter in about 8 years, and require very careful watering. Plants need 12 or more years to reach the flowering size.